The National Chairman of the All Progressives Congress (APC), Adams Oshiomhole, has disclosed that the Peoples Democratic Party (PDP) is planning to boycott the 2019 general elections because the party knew its end has come. Speaking during the submission of the Osun state primary election result by the Chairman of the election committee and Governor of Zamfara State, Abdulaziz Yari, Oshiomhole said the APC was not desperate to win elections. Oshiomhole also said that the APC worked hard to defeat the PDP while they were in power and at a time when they had no faction and when all the founding fathers and founding mothers were in the same house. Oshiomhole said nobody could threaten democracy, adding that Nigerians have accepted it; they have bought into it, and have shown their belief in it by the shared number of people who voted in the last election. He said all the campaigns about “people go and take your PVCs” meant that beyond political parties, Nigerians were committed to the sustenance of democracy. Oshiomhole further said democracy was not at the mercy of any particular political party, saying that the APC cannot be threatened and be intimidated, even as he said the APC would insist that one man, one vote is the way to go. He also said the APC is committed to one man, one vote and will sustain it and elevate it to the next level. According to Oshiomhole, “Let me also use this opportunity to comment on what I read about… I saw the PDP chairman threatening that they may boycott the 2019 election. “Now, when a rabbit, because I come from a village, when a rabbit in the afternoon jumps out of the hole not because the hunter has come to smoke it out and it is running, you know it has already seen its end. “But the truth is that we are not desperate. We have worked hard to defeat PDP while they were in power, when they had no faction, when all the founding fathers and founding fathers were in the same house, we defeated them. “Nigerian people rejected them on account of 16 years of absolute misrule at the peak of our prosperity as a nation when oil sold for $140 a barrel and we came in when oil price has dropped. “If with all those huge revenue that accrued to them, people complained of bad roads whether from the south to the east, from the north to the west, they have nothing new to offer to the Nigerian people. “So, I think they are hunted by their own ghost and because they had perpetuated a do-or-die politics and they are on record both electronic and print as saying that election matter is about do or die. “One of their old man was recorded as saying that and they perfected the language of ring them out, let them go to court. “Now, rigging machine has been dismantled and how can they survive without it? The glue that held them together which was cheap money from federal treasury, again, that has been cut off. What they already have like a typical village sheep, they may be chewing it all day, all night. “You know in the day time, the sheep will go to grab every food they can get so that at night, it is chewing. Just reprocessing. 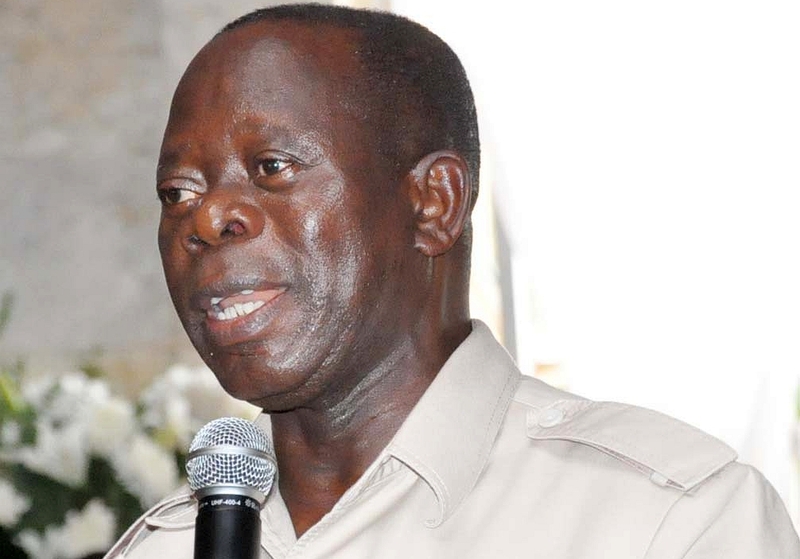 “It appeared they have almost finished digesting what they have taken and now they are worried about how they can sustain power and they are threatening,” Oshiomhole said. On the forthcoming Osun State governorship election, Oshiomhole said since the PDP got stuck in Ekiti, he was sure that they would be flat during Osun State gubernatorial election. Speaking earlier,Governor Yari said about 17 aspirants participated in the Osun primary election, while two of the aspirants withdrew, adding that they did not communicate to the committee officially. Yari said the election was well-organised, ward by ward, adding that there was no heavy security and the people conducted themselves in an orderly manner. Yari said Isiaka Oyetola scored 127,17 votes to emerge the winner of the Osun primary election, with the Deputy Speaker of the House of Representatives, Yusuf Lasun, came second with 21,975. “And the full report will be submitted finally on Monday by 2’o clock. But we know the urgency of having this result,” Yari said. He expressed appreciation to Oshiomhole and prayed that the APC will be victorious in the September election. You Adams Oshiomohle will lead APC to it’s grave in 2019. NDIGBO will never vote for you and your herdsmen. The middle belt worst hit by your murderous acts have put a course on any person from their zone who votes for you in 2019. The south west are at Cross roads. Even the core north aren’t safe from your onslaught. Keep talking recklessly like a tout you are. Adams Oshiomhole is suffering from self-esteem. He’s a coward and Hausa-Fulani slave boy. Adams Oshiomohle, you should be ashamed of heading a party that has killed and internally displaced the same people that voted for APC . Adams get ready to get the shocker of your life. The north has rejected buhari. The west can never be relied on. The east has never been your friend. The south south hates you. Shame on you. The innocent blood of nigerians your herdsmen killed will haunt you to death.